It's amazing how three letters can change your life forever. For my family, those three letters were SMA. 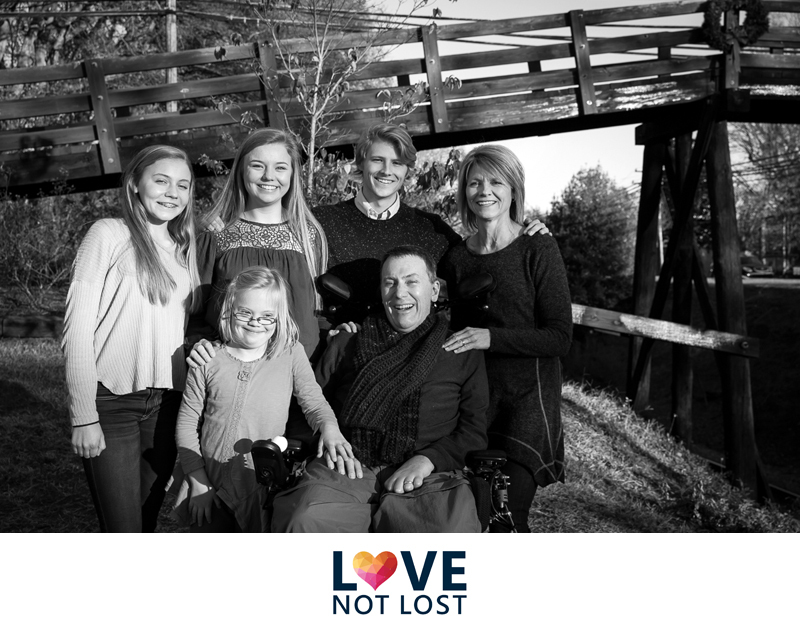 For the Wood family, it was ALS. Both SMA and ALS have a similar prognosis with no cure. Barry is a dad of 4, a loving husband, and a really awesome guy. By the time I met him, ALS had already taken his ability to walk, speak, and move on his own, but Barry didn't let that stop him from living and loving. His bright blue eyes seemed to sparkle as if they were trying to let out the joy Barry had inside. He greeted me with the help of his computer eye-gaze system that spoke for him and was full of smiles as his family surrounded him. I could just tell he was the nicest guy and looked forward to our session together. We started by taking a few photos in their home with their sweet dog and then we loaded up in the van to go to a few other meaningful places around their town in North Carolina. We went to their church where Barry and Carmen were married, where Barry's dad was on leadership, and where Barry installed and ran much of the sound for years. I don't know why I had pictured a medium sized traditional looking church in my head when they told me about it, but I couldn't have been more wrong in my assumptions. When we turned down the lane and the church came into view, I felt as if I were entering a kingdom and probably had a look on my face as if I were seeing the Disney castle for the first time. Barry's dad and sister were waiting for us at the church so they could join in on making memories together. As I entered the church, there was a gigantic decorated Christmas tree in celebration of Christmas - it was the middle of December after all. It made a lovely backdrop for photos to mark the season and give the family options for a Christmas card or gifts for the holidays. Barry's dad was standing close by, looking sharp in a suit and tie. We made small talk for a little bit where he casually mentioned that he was 90 years old. I was floored! I was tempted to make him show me his license to prove it. He looked so great for 90, so I asked him what his secret was… He told me there was no secret. When he reached a point where he felt like he could be nearing the end, he asked God for 10 more years. He believes God granted him the request and he has a couple of years left. He said after that, he'll be satisfied and ready to go home. The man's faith was astounding. I think I just stood there in awe for a good while before grabbing my camera. I could tell that Barry and his father were similar. They both were very peaceful and kind men. Even with ALS, Barry seemed to maintain a positive attitude, which is extremely admirable. ALS is a wicked disease. You keep all of your mental functions and are fully "normal" in your mind, but your body fails you. You turn into a paralyzed shell as you watch your bodily functions give out over time. As I watched my daughter go through a similar journey, I could only imagine the frustrations as an adult. I could see Barry try to communicate but unable to get the words out in a way anyone could understand. He would have conversation flying around him and couldn't contribute his thoughts or feelings. He would get tired, he would drool, he needed to be fed through a tube in his stomach. But he was smiling. His eyes were lit up with love for his family and joy for life. As we took photos of his family members individually next to Barry, we had some really great moments full of laughter and some intimate moments with subtle tears. It was a really beautiful time together where I too joined in on the laughter and tears. We moved into the sanctuary to take a big family photo since that's where Barry and Carmen were married. You could see the pride in Barry's face as he looked around - looking at the speakers and new equipment they had recently upgraded. You could see the satisfaction in his face when he looked at his family - the love for his wife and their beautiful children. 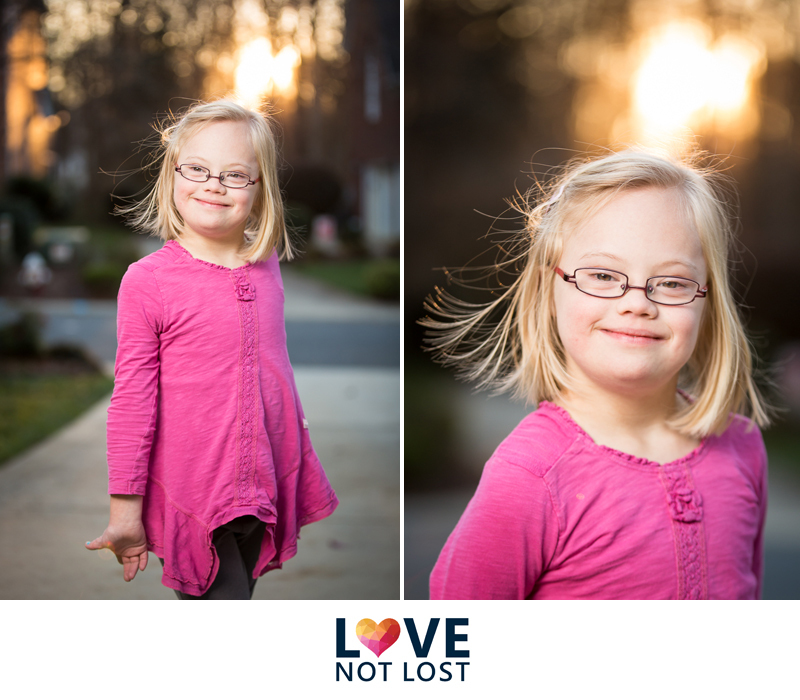 I am so honored to be invited to capture these moments for families and witness the greatness of life and love. It's something I hope we as a society and as individuals never shy away from and instead cling to it, treasure it, and celebrate it for as long as we live. After photos in the church, we said goodbye to Barry's dad and sister and moved to the downtown square where the shops, train tracks, and park area came together. We took a few photos with the park in the background and some with the bridge. Carmen ran to the car to get something and Barry was trying to tell me something. It seemed like two words, two syllables in each word by the sound he was making. His kids gathered around me to help decipher what he could be saying. For several minutes, we tried to figure it out. Finally, I could tell he was looking at something over my shoulder every time he made the sounds, so finally I looked over and there was a water tower. I exclaimed, "Water Tower!!!" and he tilted his head back in relief and we all laughed, cheered, smiled, and I promised to get a picture with the water tower in the background for him. That is a glimpse into the struggle of ALS. I thanked Barry for being so patient with me and told him I was sorry he had to fight so hard for such small things. I can't imagine the frustration of losing such simple abilities - things we all take for granted because they are "normal" and feel like a guarantee. As Carmen, his wife said in the application they sent to us, "ALS is a progressive disease with no cure. You are never really sure what that means until you live it out, day by day. There's something about marking a moment in time, even if it's difficult, it's real and where we are. Would love some photos to remember that even through all the struggles, we are still family and living life one day at a time, enjoying the moments - big and small." That day, there were some struggles. There were lots of moments to be enjoyed. We marked time together and captured their real life right where they were. In fact, when we returned to their home, the sun was setting through the bare trees and lit up the sky. I convinced the kids to let me take individual pictures of them and Barry stayed outside with me to watch. He was such a good sport because it was getting colder by the second, and at the very end, I convinced Barry to let me photograph him by himself for a surprise portrait to give to Carmen which you can see in the sneak peek. When we went back inside to warm up, the kids were putting ornaments on the tree and we captured some sweet moments of the family sitting together in the living room, sharing stories, and enjoying time together. Saying goodbye is always hard - probably the hardest part of my job. This session hit especially close to home because ALS and SMA are so similar. I cried a good portion of the way home, struggling with how unfair life is and knowing the pain and suffering this family would have to endure. I was extremely grateful for the opportunity to meet Barry and his family, and sad I couldn't have met them sooner. I would've loved to sit with Barry and hear his stories and experience life with him before ALS. However, I am glad I was able to meet him and photograph him when I did. Yesterday, I received a text message from Carmen that Barry had passed away. My heart is so heavy and I wanted to share Barry's story with you today (with permission from Carmen) to honor his life and pay tribute to their family. In the few short hours I had with him and his family, he made a profound impact on me, as did his family. Their love, strength, and courage could be felt the moment you entered the room and long after you left. I am so so grateful I had the opportunity to meet Barry and spend half the day with the Wood family. I know he will be deeply missed as he was greatly loved. Carmen, thank you for inviting me into your story and allowing me to capture a piece of it. To the entire Wood Family - I am so sorry for your loss. May you find peace and comfort in the days to come as you grieve the loss of a great man. My heart is with you. Donors and Sponsors - Thank you for helping us capture these moments with amazing families like the Wood family - it makes a difference. We truly can't do this without your support. Join our email list to get a digital “You’re Not Alone” empathy card, exclusive updates on Love Not Lost, including what city we're serving next, upcoming events, and stories you won't find anywhere else. We will never sell or spam your email. Think people should know about LNL? Share with your friends and followers!